Description of "The Kaagbhusund Ramayan or The Aadi Ramayan"
The “Kaagbhusund Ramayan” (pronounced as “kāg-bhusunda rāmāyaṇa”) is a part of the epic story of Lord Ram as narrated in the famed book ‘Ram Charit Manas’ by Goswami Tulsidas. It is also known as the “Aadi Ramayan” (ādi-rāmāyaṇa) because it is the most ancient and the first narrative of the sacred, holy and divine story that describes the life and time of Lord Ram, a manifestation of the Supreme Being in the form of a human being on earth, and the deeds done by the Lord during his sojourn on earth. It is ‘the most ancient and the first such narration’ of the story of Lord Ram because it was first conceived by Lord Shiva, the wisest, the most enlightened and self-realised Lord God amongst all the Gods, in his Mana (mind and heart) during meditation as he was contemplating on the divine form of Lord Ram, his revered deity. When the appropriate time came he had revealed it to first to his consort Uma or Parvati when she showed her eagerness to hear it, and then to the saintly crow named Kaag-Bhusund. Hence, these two were the first hearers of this story. In due course of time the sacred story of Lord Ram was narrated by the saintly crow Kaag-Bhusund to Garud, the mount of Lord Vishnu. Hence, this Kaag-Bhusund Ramayan is the first ever narration of the holy story of Lord Ram by any Jiva, a living being, to another Jiva—i.e. Kaag-Bhusund to Garud respectively. An attractive and characteristic feature of the present English rendering of this wonderful and fascinating story is that it contains the original Text that is accompanied by verse-to-verse Roman Transliteration, followed by a detailed exposition in a simple and lucid language, aided by notes that further elaborate on the subject matter and explain it. The story is rich in spiritual content, and it stresses on the value and importance of the glorious virtue of devotion and affection for Lord God and the need to surrender oneself to Him as a means of attaining fulfilment in life as well as to have a sense of abiding peace, bliss and beatitude. 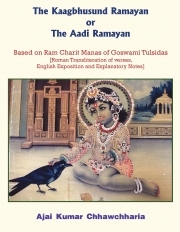 Reviews of "The Kaagbhusund Ramayan or The Aadi Ramayan"